I was surprised to see varities from the Gordon Biersch Brewing Company at Jubilation Wine and Spirits today. Gordon Biersch is a brewery/brewpub chain out of California specializing in German style beers. They make about six different varities that I know of, but the only ones here in Albuquerque so far are the Marzen and the Hefeweizen. The Marzen is a 5.7% Oktoberfest-style beer that is smooth and fairly malty, with little to no hop presence. I like this stlye and will drink it over an amber ale any day. Except today. I'm not going to drink either of those- I've got some new beers coming to me this evening- but more on that another day. The Hefeweizen (5.4%) is quite the authentic German hefe clone. It is a perfect beer for the Summer, when super hoppy IPAs or rich stouts can be too hard to swallow but lawnmower beers seem too tasteless. Both of these beers are selling for $7.99, which brings me to the point of this story. While the labels of these two beers may be new here, the beers inside the bottles have been with us for over two years now. Trader Joe' s has a line of beers that is private-labeled for them by Gordon Biersch. 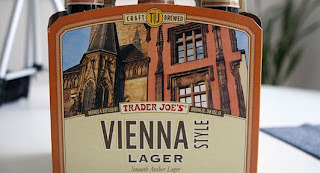 They have the Hefeweizen and the Marzen, which goes by the "Vienna Lager" moniker at Trader Joe's. They also have a Dunkelweizen and a Bock. So the beers are essentially the same, but the price is a killer $5.99 at Trader Joe's, compared to the $7.99 you'll pay for the Gordon Biersch label. I think I will deal with the crowds at Trader Joe's and save myself a couple of bucks. Plus they have free food samples at Trader Joe's. 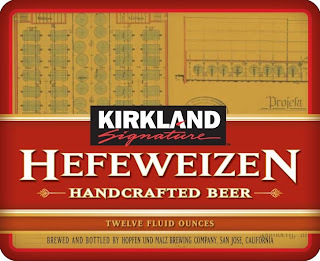 Speaking of free samples, Gordon Biersch is also brewing beer for Costco under the Kirkland label! I hate going to Costco so I can't tell you if they are being carried here yet, but I know that a deal was in the works earlier this year. Wow, three different labels for the same product. Sounds like the kind of thing Rogue does. Let's just hope Gordon Biersch doesn't start using ceramic bottles for their beer! HAHA!!! real funny comment on the Rogue. Oh well I like there Dead Guy Ale it is fabulous.